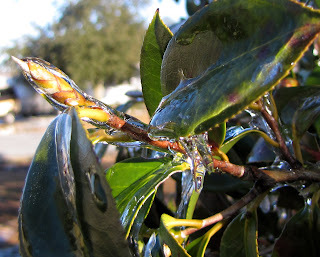 After I posted the pics of the ice storm, I got much better pics the next day because the sun came out (which melted all the lovely ice by the end of the day) and I just wanted to share a few of my favorites. Wow. Amazing photos. Glad not to be outside there then! that ice I know is pretty treacherous but sure makes for some beautiful scenes. 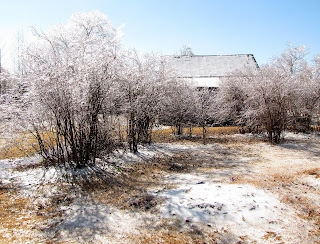 mI think I have only seen one ice storm in my life when I was a kid. In Wyoming it always turns from any kind of rain straight to snow. An elevation thing I think. Love how you topped it off with a blueberry cobbler. Need my adresss for that? Probably gone by now though. Beautiful in its own way! Love the cardinal and the seedpod pics!! Is that a rubber tree plant in the first pic? Your pictures are gorgeous Teresa, especially with the brightness of the sun on the melting ice. 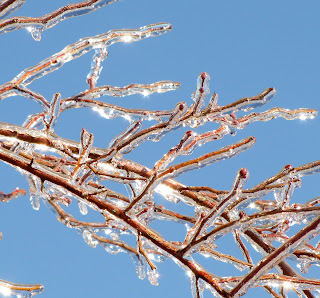 Oh My I have never seen an ice storm. what amazing photos. Hope you saved us some of that yummy Blueberry Cobler. YUM with nice thick custard. My mouth is watering here. Amazing photos! Makes me COLD looking at them. 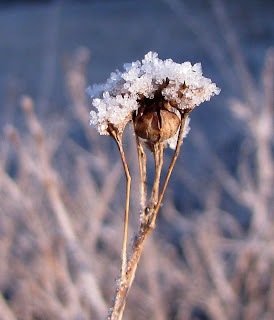 My favorite is the ice crystals on the rose hip -- at least that is what I think it is. 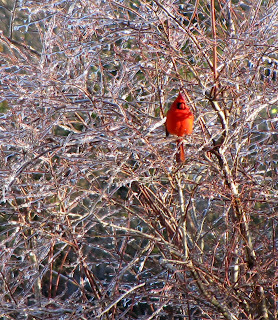 What beautiful scenes - love the cardinal in the icy branches! Poor little cold Cardinal. He needs for you to knit him a sweater and some mittens for his feet. Your photos are amazing! 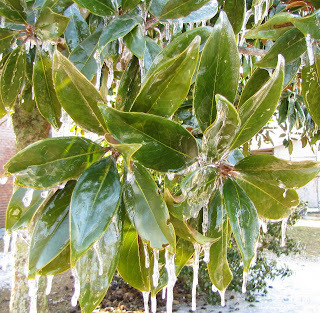 I'm always awed by ice on the magnolia leaves. 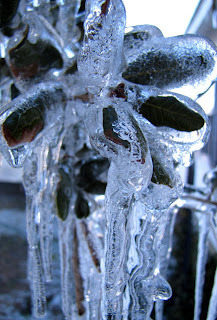 Ice encasing leaves that scream warm, sultry, languid days and sweetly perfumed nights is such a jolting contrast. I won't diss winter since I know how much you like it - I'll just agree with Claire and say that your photos are realistic enough to make me cold! Good job! What an amazing eye for a picture you have. These photos are inspiring. Well, you are an artist at photography, too. These are great. Great shot of the cardinal. Thank you so much for voting for the bees ! Great photos--it's like everything's coated with a crust of sugar! Love all these great wintery photos. Really beautiful! I love the shots of the ice! It is so pretty! We got snow and very little ice, and I am happy about that! 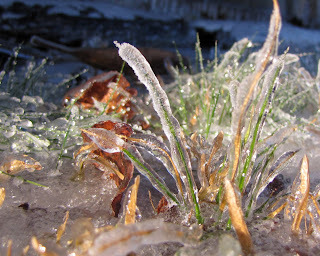 Love the last photo, the ice thick on the leaves. You caught something very beautiful in it.